Located in Summerville, Georgia, and the Druid Hills neighborhood in Atlanta, the law firm Cook & Connelly offers services to those facing criminal charges, personal injury or family law issues. We have a long and rich history of serving clients throughout northwest Georgia on a wide range of legal matters. 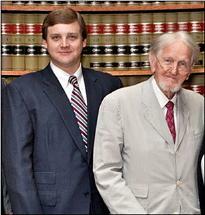 Founded by Bobby Lee Cook and the late A. Cecil Palmour in 1959, our law firm takes pride in treating each client with the individual attention that started with our founders and continues today with Cook’s grandsons Sutton Connelly and Jeffrey Connelly, who are moving us forward into the future. At Cook & Connelly, we understand that every client’s legal issues are different, and a cornerstone of our philosophy is to listen to the needs and goals of our clients, and move you through the legal process toward the best possible resolution. We also believe that hard work and dedication to justice are the best ways to get these results. In addition, while we do not claim to be better than other law firms, we do feel that this approach makes us unique and special. With resources commonly expected only at larger law firms, we also stand apart as accomplished and experienced trial lawyers who handle the biggest cases, including capital criminal defense cases, a delicate family law matter, a life-altering personal injury or a wrongful death claim. Whatever the legal matter, the attorneys at Cook & Connelly are here to provide quality service that addresses your specific legal needs. Contact us today to set up a free initial consultation.